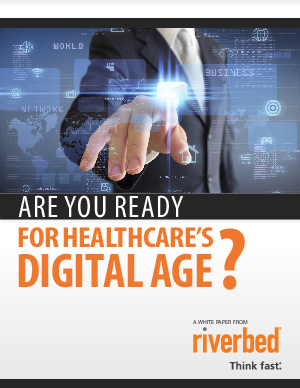 > Research Library > Riverbed > Are You Ready for Healthcare's Digital Age? Hospitals and healthcare providers are united under one central mission: to provide exceptional care to patients while keeping costs down. Increasingly, that’s being accomplished through technology, and healthcare providers are becoming incredibly dependent on IT for their day-to-day operations. Take applications such as electronic health record (EHR) systems. They were rare several years ago but they’re now the lifeblood in this industry and are being used by 78% of doctors, according to the National Center for Health Statistics. Doctors depend on those applications to access and share patient data in critical and often life-and-death situations. On top of EHRs, healthcare providers are using other clinical tools, such as computerized order systems and electronic prescribing systems. Practice management and billing and coding software make sure the business side of the operation is running smoothly. That technology brings a lot of benefits, but it also adds risk. Systems sometimes go down, and it’s happening more often as complexity rises due to cloud computing, mobile devices, growing data volumes, and other factors.